President Trump has singled out unfair international trading relationships as a major cause of US worker hardship. And he has promised to take decisive action to change those relationships by pressuring foreign governments to rework their trade agreements with the US and change their economic policies. While international economic dynamics have indeed worked to the disadvantage of many US workers, Trump’s framing of the problem is highly misleading and his promised responses are unlikely to do much, if anything, to improve majority working and living conditions. President Trump and his main advisers have aimed their strongest words at Mexico and China, pointing out that the US runs large trade deficits with each, leading to job losses in the US. For example, Bloomberg News reports that Peter Navarro, the head of President Trump’s newly formed White House National Trade Council “has blamed Nafta and China’s 2001 entry into the World Trade Organization for much, if not all, of a 15-year economic slowdown in the U.S.” In other words, poor negotiating skills on the part of past US administrations has allowed Mexico and China, and their workers, to gain at the expense of the US economy and its workers. However, this nation-state framing of the origins of contemporary US economic problems is seriously flawed. It also serves to direct attention away from the root cause of those problems: the profit-maximizing strategies of large, especially US, multinational corporations. It is the power of these corporations that must be confronted if current trends are to be reversed. Beginning in the late 1980s large multinational corporations, including those headquartered in the US, began a concerted effort to reverse declining profits by establishing cross border production networks (or global value chains). This process knitted together highly segmented economic processes across national borders in ways that allowed these corporations to lower their labor costs as well as reduce their tax and regulatory obligations. Their globalization strategy succeeded; corporate profits soared. It is also no longer helpful to think about international trade in simple nation-state terms. Global trade and foreign direct investment have grown exponentially over the last decade as firms expanded international production networks, trading inputs and outputs between affiliates and partners in GVCs [Global Value Chains]. About 60 per cent of global trade, which today amounts to more than $20 trillion, consists of trade in intermediate goods and services that are incorporated at various stages in the production process of goods and services for final consumption. The fragmentation of production processes and the international dispersion of tasks and activities within them have led to the emergence of borderless production systems – which may be sequential chains or complex networks and which may be global, regional or span only two countries. In other words, multinational corporations have connected and reshaped national economies along lines that best maximize their profit. And that includes the US economy. As we see in the figure below, taken from an article by Adam Hersh and Ethan Gurwitz, the share of all US merchandise imports that are intra-firm, meaning are sold by one unit of a multinational corporation to another unit of the same multinational, has slowly but steadily increased, reaching 50 percent in 2013. The percentage is considerably higher for imports of manufactures, including in key sectors like electrical, machinery, transportation, and chemicals. 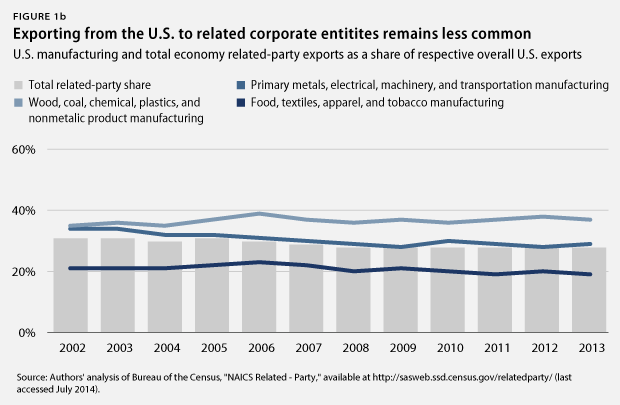 The percentage is lower, but still significant for US exports. 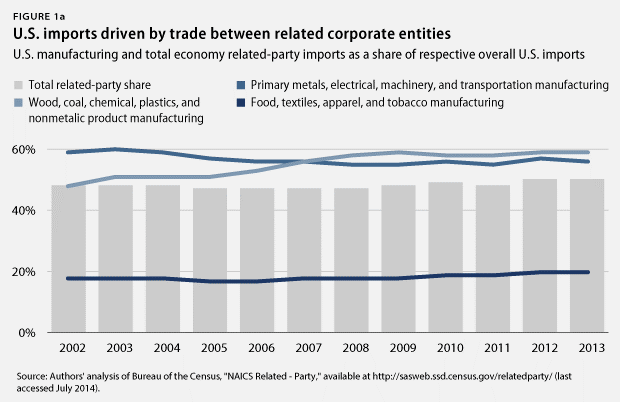 As we see in the following figure, approximately one-third of all merchandise exports from the US are sold by one unit of a multinational corporation to another unit of the same company. 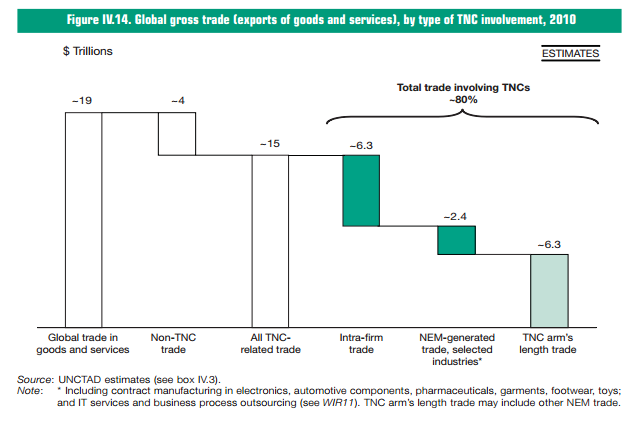 The percentage of intra-firm trade is far higher for services, as illustrated in the next figure. The trend is clear: As offshoring practices increase, companies need to provide more wraparound services—the things needed to run a businesses besides direct production—to their offshore production and research and development activities. 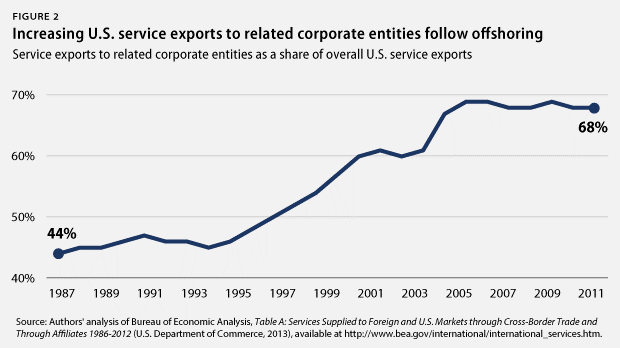 Rather than indicating the competitive strength of U.S. services businesses to expand abroad, the growth in services exports follows the pervasive offshoring of manufacturing and commercial research activities. Thus, there is no simple way to change US trade patterns, and by extension domestic economic processes, without directly challenging the profit maximizing strategies of leading multinational corporations. To demonstrate why this understanding is a direct challenge to President Trump’s claims that political pressure on major trading partners, especially Mexico and China, can succeed in boosting the fortunes of US workers, we look next at the forces shaping US trade relationships with these two countries. US corporations, taking advantage of NAFTA and the Mexican peso crisis that followed in 1994-95, poured billions of dollars into the country (see the figure below). Their investment helped to dramatically expand a foreign-dominated export sector aimed at the US market that functions as part of a North American region-wide production system and operates independent of the stagnating domestic Mexican economy. 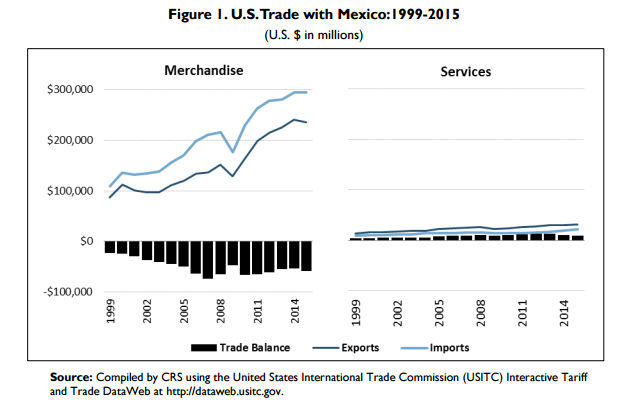 Some 80 percent of Mexico’s exports are sold to the US and the country runs a significant merchandise trade surplus with the US, as shown in the figure below. 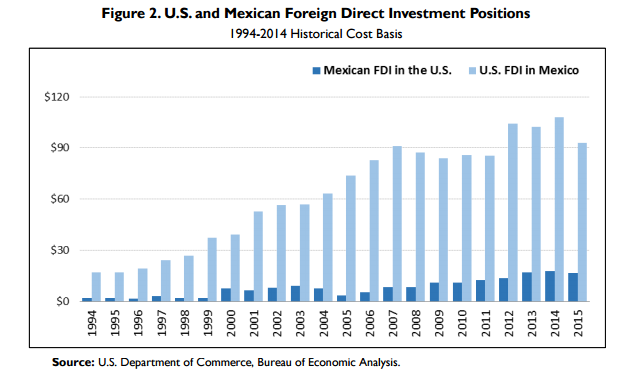 A significant portion of merchandise trade between the United States and Mexico occurs in the context of production sharing as manufacturers in each country work together to create goods. Trade expansion has resulted in the creation of vertical supply relationships, especially along the U.S.-Mexico border. The flow of intermediate inputs produced in the United States and exported to Mexico and the return flow of finished products greatly increased the importance of the U.S.- Mexico border region as a production site. U.S. manufacturing industries, including automotive, electronics, appliances, and machinery, all rely on the assistance of Mexican [based] manufacturers. One report estimates that 40% of the content of U.S. imports of goods from Mexico consists of U.S. value added content. Wages tell a similar story: There’s been almost no growth in real inflation-adjusted wages since 1994 — just about 4.1 percent over 21 years. In contrast, depressed pay has become the “comparative advantage”. Mexican autoworker compensation is 14 percent of their unionized U.S. counterparts and auto parts workers earn even less–$2.40 an hour. Automation is not the driving force; its depressed wages and working conditions. In other words, US workers aren’t the only workers to suffer from the globalization strategies of multinational corporations. Mexican workers are also suffering, and resisting. 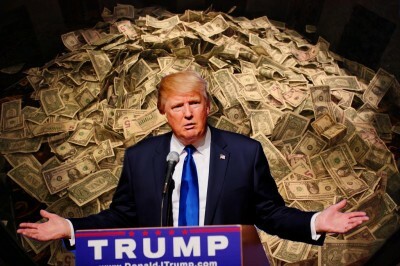 In sum, it is hard to square this reality with Trump’s claim that because of the way NAFTA was negotiated Mexico “has made us look foolish.” The truth is that NAFTA, as designed, helped further a corporate driven globalization process that has greatly benefited US corporations, as well as Mexican political and business elites, at the expense of workers on both sides of the border. Blaming Mexico serves only to distract US workers from the real story. The US soon became the primary target of China’s exports (see the trade figures below). The US now imports more goods from China than from any other country, approximately $480 billion in 2015, followed by Canada and Mexico (roughly $300 billion each). The US also runs its largest merchandise trade deficit with China, $367 billion in 2015, equal to 48 percent of the overall US merchandise trade deficit. In second place was Germany, at only $75 billion. (F)or 825 products, out of a total of about 5,000, adding up to nearly $300 billion, China supplies more than all our other trade partners combined. Of these products, the most important is cell phones, where $40 billion in imports from China account for more than three-quarters of the total value imported. There are also 83 products where 90 percent or more of US imports come from China; together these accounted for a total of $56 billion in 2015. The most important individual product in this category is laptop computers, which alone have an import value of $37 billion from China, making up 93 percent of the total imported. First, although the Chinese state retains important levers of control over economic activity, especially the state-owned banking system, the great majority of industrial production and export activity is carried out by private firms. In 2012, state-owned enterprises accounted for only 24 percent of Chinese industrial output and 18 percent of urban employment. 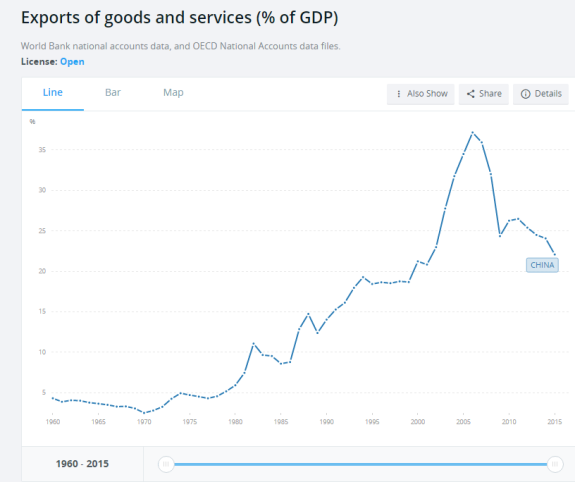 As for exports, by 2013 the share of state-owned enterprises was down to 11 percent. Foreign-owned multinationals were responsible for 47 percent of all Chinese exports. And, most importantly in terms of their effect on the US economy, multinational corporations produce approximately 82 percent of China’s high-technology exports. Second, although these high-tech exports come from China, for the most part they are not really “Chinese” exports. As noted above, China now functions as the primary assembly point for the region’s cross border production networks. Thus, the majority of the parts and components used in Chinese-based production of high-technology goods come from firms operating in other Asian countries. In many cases China’s only contribution is its low-paid labor. In a widely cited study, researchers found that Apple created most of the product’s value through its product design, software development and marketing operations, most of which happen in the United States. Apple ended up keeping about 58 percent of the iPhone 4’s sales price. The gross profits of Korean companies LG and Samsung, which provided the phone’s display and memory chips, captured another 5 percent of the sales price. Less than 2 percent of the sales price went to pay for Chinese labor. “We estimate that only $10 or less in direct labor wages that go into an iPhone or iPad is paid to China workers. So while each unit sold in the U.S. adds from $229 to $275 to the U.S.-China trade deficit (the estimated factory costs of an iPhone or iPad), the portion retained in China’s economy is a tiny fraction of that amount,” the researchers wrote. The same situation exists with laptop computers, which are assembled by Chinese workers under the direction of Taiwanese companies using imported components and then exported as Chinese exports. Economists have estimated that the US-Chinese trade balance would be reduced by some 40 percent if the value of these imported components were subtracted from Chinese exports. Thus, it is not Chinese state enterprises, or even Chinese private enterprises, that are driving China’s exports to the US. Rather it is foreign multinationals, many of which are headquartered in the US, including Apple, Dell, and Walmart. And much like in Mexico, Chinese workers enjoy few if any benefits from their work producing their country’s exports. The figure below highlights the steady fall in labor compensation as a share of China’s GDP. Approximately 80 percent of Chinese manufacturing workers are internal migrants with a rural household registration. This means they are not entitled to access the free or subsidized public health care, education, or other social services available in the urban areas where they now work; the same is true for their children even if they are born in urban areas. Moreover, most migrants receive little protection from Chinese labor laws. In 2015, seven years after the implementation of the Labor Contract Law, only 36 percent of migrant workers had signed a formal employment contract with their employer, as required by law. In fact the percentage of migrant workers with formal contracts actually declined last year by 1.8 percent from 38 percent. For short-distance migrants, the proportion was even lower, standing at just 32 percent, suggesting that the enforcement of labor laws is even less rigid in China’s inland provinces and smaller cities. According to the  migrant worker survey . . . the proportion of migrant workers with a pension or any form of social security remained at a very low level, around half the national average. In 2014, only 16.4 percent of long-distance migrants had a pension and 18.2 percent had medical insurance. In short, it is not China, or its workers, that threaten US jobs and well-being. It is the logic of capitalist globalization. Thus, Trump’s call-to-arms against China obfuscates the real cause of current US economic problems and encourages working people to pursue a strategy of nationalism that can only prove counterproductive. The globalization process highlighted above was strongly supported by all major governments, especially by successive US administrations. In contrast to Trump claims of a weak US governmental effort in support of US economic interests, US administrations used their considerable global power to secure the creation of the WTO and approval of a host of other multilateral and bilateral trade agreements, all of which provided an important infrastructure for capital mobility, thereby supporting the globalizing efforts of leading US multinational corporations. President Trump has posed as a critic of existing international arrangements, claiming that they have allowed other countries, such as Mexico and China, to prosper at US expense. He has stated that he will pursue new bilateral agreements rather than multilateral ones because they will better serve US interests and he has demanded that US multinational corporations shift their investment and production back to the US. Such statements have led some to believe that the Trump administration is serious about challenging globalization dynamics in order to rebuild the US economy in ways that will benefit working people. But there are strong reasons to doubt this. Most importantly, he seems content to threaten other governments rather than challenge the profit-maximizing logic of dominant US companies, which as we have seen is what needs to happen. One indicator: an administration serious about challenging the dynamics of globalization would have halted US participation in all ongoing negotiations for new multilateral agreements, such as the Trade in Services Agreement which is designed to encourage the privatization and deregulation of services for the benefit of multinational corporations. This has not happened. Another indicator: an administration serious about creating a healthy, sustainable, and equitable domestic economy would strengthen and expand key public services and programs; rework our tax system to make it more progressive; tighten and increase enforcement of health and safety and environmental regulations; strengthen labor laws that protect the rights of workers, including to unionize; and boost the national minimum wage. The Trump administration appears determined to do the opposite. The main reason is that US corporations, having battered organized labor with the assistance of successive administrations, have largely stopped creating jobs that provide the basis for economic security and well-being. Economists Lawrence F. Katz and Alan B. Krueger examined the growth from 2005 to 2015 in “alternative work arrangements,” which they defined as temporary help agency workers, on-call workers, contract workers, and independent contractors or freelancers. A striking implication of these estimates is that all of the net employment growth in the U.S. economy from 2005 to 2015 appears to have occurred in alternative work arrangements. Total employment according to the CPS increased by 9.1 million (6.5 percent) over the decade, from 140.4 million in February 2005 to 149.4 in November 2015. The increase in the share of workers in alternative work arrangements from 10.1 percent in 2005 to 15.8 percent in 2015 implies that the number of workers employed in alternative arrangement increased by 9.4 million (66.5 percent), from 14.2 million in February 2005 to 23.6 million in November 2015. Thus, these figures imply that employment in traditional jobs (standard employment arrangements) slightly declined by 0.4 million (0.3 percent) from 126.2 million in February 2005 to 125.8 million in November 2015. A further increase in employment in such “alternative work arrangements,” which means jobs with no benefits or security, during a period of Trump administration-directed attacks on our social services, labor laws, and health and safety and environmental standards is no answer to our problems. Despite what President Trump says, our problems are not caused by other governments or workers in other countries. Instead, they are the result of the logic of capitalism. The Trump administration, really no US administration, is going to willingly challenge that. That is up to us.